Life in a 373 square-foot condo—that’s the new benchmark for affordable home ownership in downtown Toronto today. Grid Condos is a new “micro condo” residential project from CentreCourt Developments, a company that specializes in developing urban space for young professionals. Situated at the corner of Dundas and Jarvis Streets near Ryerson University, the 51-storey, 563-unit project, currently in pre-construction and sold out, will feature units ranging from 373 to 866 square feet, priced from the upper $200,000s to the high $400,000s. As to who actually purchased units in the Grid, Virani identifies three primary buyers. Topping the list are investors who plan to rent to students and faculty. Next are parents of students, followed by actual end users. The team of Podium Developments and Building Capital also knows it hit the mark with their University Studios project at 1900 Simcoe St. next door to the University of Ontario Institute of Technology and Durham College in Oshawa. As a testament to the pressing demand for student housing in the area, the entire eight-storey Wallman Architects-designed student residence—all 308 units—sold out in two weeks. The subsequent phase of the project, University Towns—consisting of mostly stacked townhomes but also an additional 36 studio units—sold out in two days! “(Both campuses) currently aren’t committed to building more student housing, so University Studios gives students the option to live nearby,” says Saqib Qureshi, Partner at Building Capital. Also assisting demand was Podium’s recognition of the desire for privacy by many senior students, who no longer want to share five-bedroom dorms, coupled with the fact that no bachelor studio units had been built in Oshawa since 1989. As with CentreCourt’s Grid condos, many of the University Studio units were snatched up by investors who aim to rent them out to students. In addition to student housing demand, the Oshawa area is experiencing a surge in population that has had an impact on real estate prices in the city. Appreciation rates are projected as high as 15%/year for some areas. University Studios’ SmartStudios concept, inspired by similar student residences in Sweden, features a space-saving design specifically tailored to the student needs. “The concept has become an international reality and has now arrived in the GTA,” says Podium Director Oskar Johansson. living spaces are getting smaller across the GTA, especially in downtown Toronto. Huggett is also seeing an expanding market. “We’re trying to be at the leading edge in terms of student living. But our purchasers aren’t necessarily just students and investors,” he says. “We’ve seen interest from professors and young professionals, especially those who don’t need to live there year-round or who are commuting a couple days a week. “There’s also a demand for ‘accessible’ micro-studios. It might sound like an oxymoron in terms of needing space with higher turning radiuses, etc.,” says Huggett. “While we offer a variety of typical studio suites of around 275 square feet, through smart design we’ve also developed an accessible suite that meet the majority of Oshawa’s very stringent accessible standards: counter heights, more room in the bathroom, interchangeable beds that allow for a little more clearance to get in and out, door hardware, etc. We’ve created a suite type that’s very flexible for a number of users. While building smaller units theoretically means additional condos to sell in each building, it created a few significant challenges in terms of planning approvals for Podium, primarily with respect to parking and density ratios, Huggett notes. The development’s proximity to the campus property didn’t hurt the argument. The City of Oshawa has also made the units more financially accessible by providing a grant that allows developers to offset some costs of new construction. By reducing some local municipal development charges in that corridor, it has made the units more affordable. Selling the micro units furnished has also proved a wise decision, making life—particularly the move-in phase—significantly easier and quicker for students, with a lot less residual damage to elevators and the units themselves that typically accompanies student arrival and departure. There’s also not the typical end-of-year garbage dump of trashy furniture. “If nothing else, these SmartStudios provide a nice balance of options in a location,” says Huggett, whose company is looking at other areas of Southern Ontario, as well as considering expanding to the United States. While detractors says it’s like living in a shoebox, providing a comfortable lifestyle for occupants is all about functionality, says Virani. “You have to be thoughtful and efficient with the spaces,” he says. “We spend a painstaking amount of time on the front end of projects. On the Grid Condos, we worked with our architects, Page + Steele/IBI Group, to design from the inside out, beginning with the floor plans. In addition to containing either one or two separate bedrooms (some with dens), every Grid suite features open-concept living designs with high ceilings, full (yet slightly narrower) appliances in the kitchen, and bathtubs plus separate showers. The layouts feature less wasted space, no corridors, thoughtful bathroom layouts and more compact appliances. To Lierman’s point, while Grid occupants will be living in smaller personal spaces than many have been previously used to, much of that is compensated for by the many amenities available to them in the building, such as a two-storey lobby, lounge, martini bar, outdoor terraces on the second and third floors, a fitness centre and yoga studio, plus guest suites for overnight visitors. And it’s not just high-rise condos providing stylish but modestly sized living quarters. Vandyk Group of Companies’ Backyard Neighbourhood Condos bills itself as an “anti-high-rise” condo community—“an intimate, boutique-scaled neighbourhood where people interact naturally.” Situated in the midst of an established, tree-lined community in Toronto’s west end, the development is within walking distance of trails and greenspace along the Humber River, minutes from shops, dining and services on Bloor Street, the Queensway and Roncesvalles Village, and close to High Park, Lake Ontario and the TTC. In addition to offering a peaceful location away from the downtown bustle, yet close enough to its workplaces and nightlife, the Backyard complex will include “life-friendly” amenities such as a one-acre outdoor park containing a playground, interactive water features and a tree-lined boulevard, plus a 32,000 sq. ft. retail complex with a coffee shop, a food co-op, a hair salon and a medical centre with pharmacy. Currently for sale, condo units in Backyard’s first phase, The Humberside, offer more space at lower cost ($246,990 to $456,990) compared to downtown Toronto condos, ranging in size (including balcony or terrace) from 517 to 1,321 square feet. 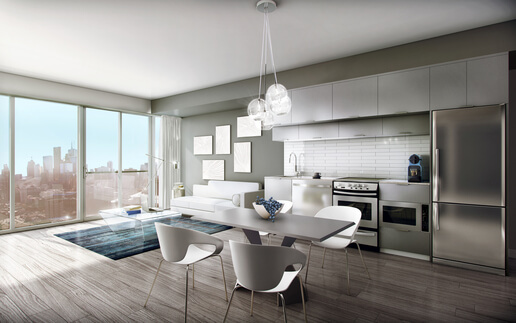 In keeping with its “lifestyle-first” philosophy, each unit has been carefully designed to include open-concept layouts and plenty of natural light. Large, usable outdoor balconies and terraces (some over 300 square feet) can accommodate furniture, offering residents an extension of the living spaces. Kohn accomplished this by creating a multifunctional space, limiting circulation areas and incorporating them into living spaces, where the living room is also the dining room is also the kitchen—like a hub to which all other rooms are connected. This offers exceptional flexibility, where the unit is customizable to a variety of residents and their lifestyles. Kuzan goes on to describe the importance of space-saving features built into The Humberside units, such as compact bathrooms and kitchens, including overhead and under-counter storage and narrower appliances. She also makes a point of highlighting the units’ generous outdoor balcony/ terrace spaces and the building’s rooftop terrace/lounge with a view of downtown Toronto and the lake, where residents can “host a dinner party for 10 to 15 people. “Great neighbourhood location, well-designed and affordable,” Kuzan adds. “It’s going to be a wonderful place to live,” she adds. Goodwin recites a list of things that builders and prospective condo buyers can do to maximize the functionality of their small spaces. In the kitchen, she recommends cabinets that extend up to the ceiling, allowing for more storage, as well as L-shaped counters and/or a “skinny island” that will allow for a two-foot counter extension that can serve as a surface for food preparation, eating and work. She would also like to see more builders opening closet entrances up to the ceiling for extra storage space, as well as using glass sliding doors to the bedrooms, which lets in light while offering some level of privacy. 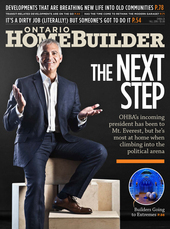 On the home front, at least one Ontario builder has mastered the art of small single-family construction. For several years, Rinaldi Homes in St. Catharines has been specializing in efficiently designed bungalows in the Niagara Region. According to Victor Krmpotic, Rinaldi’s sales and marketing manager, the company’s 1,300 sq. ft. homes continue to sell briskly, although some of its bungalow offerings have grown in size to 2,100 square feet—primarily catering to retirees downsizing from their large homes in the GTA but needing extra space for existing furniture. To accommodate retired couples, Rinaldi’s 1,300 sq. ft. bungalows feature two bedrooms and two bathrooms (one of them an ensuite) on the main floor and a large, open-concept space including the kitchen, which can be adapted to a dining and living area and allows for easier placement of furniture. Mindsets will have to change as space becomes more and more limited, suggests Grid’s Virani, who reminds us that what seems a tad cozy in the GTA is positively sprawling elsewhere around the world. “Toronto is growing into a global city built around vertical living, like New York and Hong Kong,” Virani says. “But 600 square feet is not that small compared to these cities.